Intramolecular forces: “Intra” means “within”, so these forces hold the things within molecules together. Or, to put it more clearly, these are chemical bonds. Though the electrostatic interactions in ionic bonds aren’t real bonds (no shared electrons and whatnot), these are also counted as intramolecular forces. Intramolecular forces are really really strong, because they need to be strong to hold the various atoms and ions in chemical compounds together. 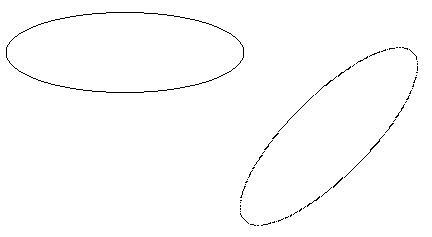 The partial positive charge on the Cl on the HCl on the left is attracted to the partial positive charge of the H on the HCl on the right. 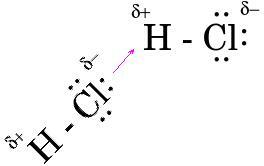 Because + and – attract, this force helps to keep the HCl molecules stuck near each other. 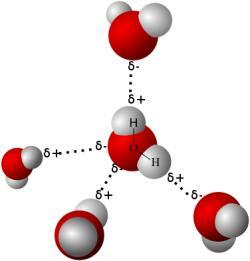 Hydrogen bonds: Very special, very strong intermolecular forces that take place when a hydrogen atom is stuck to fluorine, nitrogen, or oxygen. Here’s the deal: Fluorine, nitrogen, and oxygen are all highly electronegative and very small. As a result, they contain a very concentrated negative charge. This charge is a lot more concentrated than in other atoms. As a result, when you have molecules containing these atoms, these atoms kind of go nuts and pull electrons away from whatever they’re bonded to. HF (or HO and HN bonds) are very polar. This means that there’s a lot of partial positive and negative charge, which leads to a very strong dipole-dipole force. F and H are both very small atoms (as are N and O). As a result, they can get very close to one another, causing the already strong interaction between them to get even stronger. This strength isn’t quite as strong as it is in a bond, but it’s strong enough that people used to think that it actually was a weak bond. But it’s not. It’s just called a hydrogen bond, but it’s not a real bond. London dispersion forces (sometimes erroneously called Van der Waals forces): These are forces that take place when a partial charge on one nonpolar molecule is attracted to the partial charge on another nonpolar molecule. If you find that confusing, then you’re on the right track to understanding this stuff. 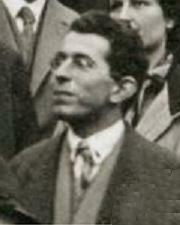 Dr. London was so well-dressed that cameras couldn’t properly focus on him. The reason you might find this confusing is that nonpolar molecules don’t have partial charges.² Saying that one partial charge on a nonpolar charge does anything at all sounds like nonsense, because it doesn’t even exist. Just as you don’t have to worry about the horns on your cat damaging your furniture³, it would seem weird to worry about the partial charge on a nonpolar molecule. As our story starts, two nonpolar molecules are just chilling. They aren’t paying any attention to each other at all. And then for no particular reason at all, random movements of electrons within the molecule on the left cause the electrons to shift, making the side with more electrons partially-negative and the side without them partially-positive. This imbalance in electrons causes the electrons in the second molecule to compensate by shifting its electrons, too. As a result, the electrons nearest the partial negative side of the first molecule move away (they have the same charges as the electrons on the other molecule), making the second molecule polar, too. This causes the molecules to attract in the same method as molecules experiencing dipole-dipole forces. However, this force doesn’t last for long. Remember, it was the random movement of electrons that caused this charge imbalance in the first place, so it’s the random movement of electrons that eventually undoes it and changes everything back to the initial state. Furthermore, because nonpolar molecules can’t be made very polar using this method, London dispersion forces are very weak. 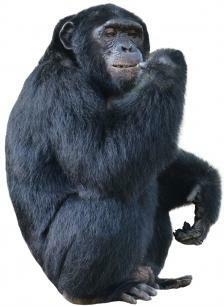 How can you tell which force is the important one for some particular molecule? If the molecule is nonpolar, then the primary intermolecular force is a London dispersion force. 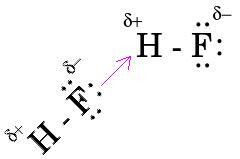 If the molecule has an H-F, H-O, or H-N bond anywhere on it, the primary intermolecular force is hydrogen bonding. If the molecule is polar but doesn’t have the bonds mentioned above, its primary intermolecular force is a dipole-dipole force. As mentioned above, intermolecular forces are much weaker than chemical bonds. However, when you compare intermolecular forces to each other, you can see based on what I mentioned above that London dispersion forces are the weakest, followed by dipole-dipole forces, and then hydrogen bonds are the strongest. That said, not all dipole-dipole forces have identical strengths with one another, nor is this the case in any other molecule. A closer look is needed. Dipole-dipole forces: Stronger than London dispersion forces, these are weaker than hydrogen bonds. Dipole-dipole forces tend to be strongest in highly polar molecules, which causes similar effects on boiling points. There are lots of examples of this, many of which you can see in this table. All of the atoms in water undergo hydrogen bonding, making the forces between these molecules extremely strong. Those little dashes are hydrogen bonds. 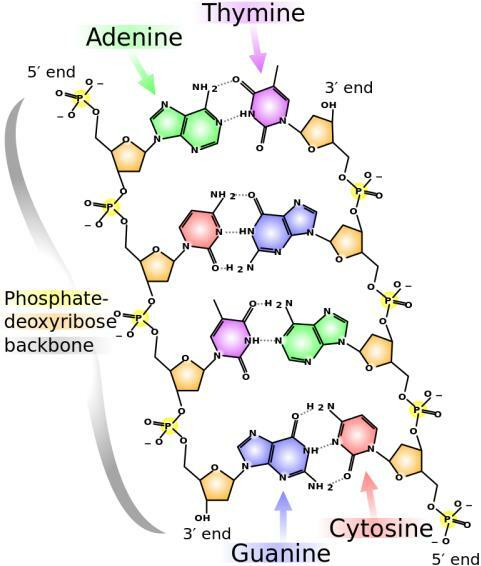 As you probably learned in biology class, nucleic acids like DNA and RNA can “unzip”⁴, do some coding stuff, and then “rezip.” They can do this because the two strands are connected via big strings of hydrogen bonds, which are strong enough to keep the two strands together under normal circumstances but not strong enough so they can’t unzip for use in cells. Video: Polar and nonpolar molecules: From the good folks at Crash Course Chemistry. Video: Intermolecular forces: From a site called Brightstorm, this great video (and great teacher, whomever she is) does an amazing job with this topic. Well, they do hold things in place in solids, but that’s because there’s not much energy around to pull the solid molecules apart. In that case, it’s not so much that the intermolecular forces are strong but that there’s so little energy around to overcome it. Other reasons: You weren’t paying that much attention, you don’t care, you’re surfing the web or updating Facebook, or your cat just mangled your leg. If you get into genetic engineering, I totally want a cat with horns. I was going to put a silly photo here, but it turns out that if you search stock photo databases for “unzip” you end up seeing terrible, terrible things. Water: By Xhmikos (Own work) [CC0], via Wikimedia Commons (Public domain). This entry was posted in Tutorial and tagged bond, covalent, dipole-dipole, hydrogen bond, intermolecular force, intramolecular force, Lewis structure, London dispersion, lone pair, monkey knife fight, nonpolar, polar, polarity, Van der Waals. Bookmark the permalink.